B. Todd Schaeffer, MD, FACS is a board certified surgeon who specializes in endoscopic surgery of the nose, face, neck, sinuses and skull base. He has been performing advance endoscopic and laser procedures for over twenty years since graduating from the Icahn School of Medicine at Mount Sinai. He is the Chief and Associate Chairman of the Department of Otolaryngology -Communicative Disorders at North Shore University Hospital in Manhasset. He is an Assistant Clinical Professor of Otolaryngology-Head & Neck Surgery at Icahn School of Medicine at Mount Sinai and the Hofstra Northwell School of Medicine. Dr. Schaeffer has been at the forefront of minimally invasive procedures by helping develop new technologies and techniques. He was the first surgeon to perform balloon sinus dilation in New York State. He was also the first sinus surgeon to perform in–office balloon sinus dilation in the northeastern United States. He has been a national clinical researcher for in-office nasal and sinus procedures. He has been a principal investigator for in office balloon endoscopic sinus procedures, sinus implants, nasal polyp studies and other novel sinus studies. Benign and malignant nasal sinus tumors are removed endoscopically by avoiding external incisions. These tumors commonly invade the skull base, which requires reconstruction with a vascularized pedicle nasal septal mucosal flap, which prevents CSF leaks. He is one of a few surgeons who have experience at CSF Leak Repair endoscopically through the nose. He works with neurosurgeons to remove brain tumors through the nose. They use 3D endoscopic technology and computer navigation to remove pituitary tumors and skull base tumors in pediatric and adult patients. These techniques are based from his experiences from the more common operations he performs for correcting a deviated nasal septum, endoscopic sinus surgery with image guidance, balloon dilation of sinuses and plastic surgery of the nose. Many of these procedures he performs in the office avoiding general anesthesia. This allows for a quicker and easier recovery. He is one of a few surgeons in the country who routinely perform correction of deviated nasal septums (Septoplasty) in the office under local anesthesia avoiding general anesthesia. This is safer for the patient and an easier recovery with less bleeding and discomfort. No nasal packing is required. "Endoscopic Cosmetic Surgery: Endoscopic Liposhaving" is a technique he original described to recontour necks for youthfulness and to remove selected fatty tumors from the neck. Rhinoplasty (reshaping the external nose) he only performs with a closed technique (no external incisions) and uses endoscopes to help eliminate small bony prominences on the bridge of the nose. This helps ensure a better profile. Blepharoplasty (eye lid surgery for youthfulness) is performed in the office with local anesthesia and mild oral sedation. This is performed for both upper and lower eyelids with skin and fat removal. This is also safer for the patient and well tolerated. 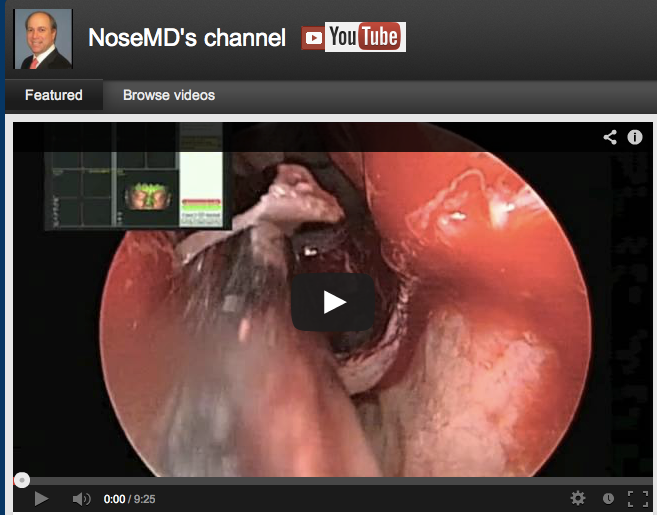 Dr. Schaeffer has numerous original publications and a wide array of medical/surgical videos posted on his YouTube channel NoseMD. He has been invited to lecture locally, nationally and internationally. Dr. Schaeffer was interviewed by Dr. Max Gomez from CBS Channel 2 on 3D endoscopic surgery. Please click here to watch the interview. Dr. Schaeffer has also been involved in local and national organizational affairs. He is a past President of the Long Island Society of Otolaryngology-Head and Neck Surgery, and is an active committee member for several different surgical Academies.